From the moment my hubby asked me to marry him, I was on cloud nine. I couldn’t wait to start my life as Mrs. Mamie L. Pack. I practiced signing my name. I flaunted my ring whenever I had the opportunity. Oh yes, I could not wait for our lives together to start. We started off doing all the right things. We did pre-marital counseling, often talked with our pastor, and loved talking to each other all the time. What I didn’t prepare for those beginning years of marriage was the doubt, fear, insecurities that lingered beneath the surface of my heart. All these little cracks were allowing ugliness to creep into the beauty of my marriage. Let me say; I didn’t realize I was sabotaging my marriage at all — actually, quite the opposite. Everything I did, I justified in my mind. I thought I was present, but I was only pushing him away. I thought I was loving, but I was critical. I wanted to smother the fear, but my fear was eating my marriage alive. Deep beneath my happiness was a lingering lie: you are not worthy of this love. No matter what my husband did, no matter how many good moments we had, no matter how many times my husband showed up, a part of me believed one day my husband would realize I was “too much,” “too difficult,” “too hard to love” then leave. I was afraid of being rejected and abandoned. Sadly, I didn’t act out of a great love. I operated out of a great fear. These words changed my heart. I was sabotaging the very relationship I prayed for; something had to change. To make a change, I needed the Holy Spirit to reveal to me the behaviors sabotaging my marriage and the steps to make a lasting change. Lesson 1: You can’t be a team of one. When I met my husband, I already had a career and was a single mother. I was accustomed to doing things my way, often relying only on me. That wasn’t the life I wanted; it was merely the life I was used to living. After being married for a while, I quickly realized I loved the idea of working together as a team, but I had a small sense of what being “one” looked like walked out each day. Without realizing it, I was sabotaging my marriage by trying to do everything on my own. Initially, I took pleasure being able to say I could do the career, take care of the kids, and have this well-organized home. (At first!) Over time, I became resentful. I folded towels angry. I washed dishes with an attitude. Surely, my husband sees me do all this work. Why doesn’t he help? Easy, I didn’t let him. Anytime my husband would ask to help, my response was usually, “I can do it,” “I’ve got it,” “Oh, I can handle it myself.” I did not give him the opportunity to help. All I did was shut him out and continued to believe I could only rely on myself to get things done. My husband was not lazy. He was not disconnected. I just didn’t let him in. I don’t know if you are anything like me, but the Holy Spirit revealed two big lessons about this area. I want to do everything on my own because I wanted CONTROL. (Such a dirty word). I tried to do everything on my own because I did not believe we were a team. I was afraid of being let down. To let this attitude go, I needed to learn how to let my husband in. I had to learn how to be a team. Sitting down, I talked with my husband about what I needed, what he could do, and how we could help each other. We decided these questions would become a part of our weekly, often daily, conversations. Allowing him to help me, showed me I could be safe even if he didn’t fold the towels the way I like. If you are struggling with being a team of one what do you do? Clearly communicate your need, expectations, and timeline. Recognize your limits and the limits of your spouse. Understand your needs, expectations, and schedule adjust as your family shifts. What works then might not work now. Their way will NOT be your way, but that doesn’t make it wrong. Lesson 2: Great love starts when you accept God’s great truth. Even while we were dating, I was often blown away by the depth of Stanley’s love for me. Even though I prayed to have a great love, I was absolutely terrified it would one day slip outside my grasp. I didn’t grow up seeing healthy, lasting relationships. Quite the contrary! I didn’t believe I was worthy to be loved, worthy to be his wife. For a while, I was able to put on a smile but over time what I truly believed would seep out my mouth. Any time we would get into “intense fellowship” I stayed tense expecting that this would be the moment our marriage would end. My doubt would show in questions like “Are we okay?” “Are we going to make it?” “Are you happy?” Little did I know, healthy disagreement was a part of marriage. I kept waiting for Stanley to somehow convince me he loved me, but he couldn’t do that. He could give me the world, but until I realized and accepted I was loved nothing mattered. My feelings of unworthiness only fed into my performance-based personality. If I didn’t feel worthy of love, maybe I could show him I was worth loving, a good investment, a good choice. UGH! I look back now so frustrated with myself, but that is where I was. To accept the love Stanley so freely gave me, it started with receiving the greatest love I would ever experience—the love of Christ. God’s love settled the places in me that were tormented from my past and trauma. The more I rested in the depths of God’s love the more I could accept the love of my husband. I stopped pushing him away and started doing the work to build a love that would last a lifetime. 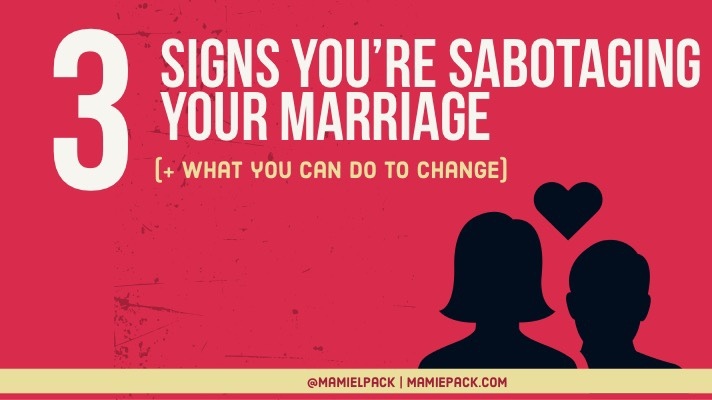 IF you are struggling with sabotaging your marriage from feelings of unworthiness, what do you do? Get God’s truth rooted in your heart. You are already loved, valued, and worthy. Speak God’s truth over yourself and your marriage EVERY day. Keep a gratitude log of all the good in your marriage. Express love and appreciation to your spouse. Working made sense to me. Building a career was the easy stuff. There were clear guidelines, set expectations, and a path of advancement. I knew just wanted I needed to do. Being married was not so easy. We had two adults adjusting to walking through life together while blending a family. Two adults who had careers, two adults with strong personalities, two adults who were polar opposites in way too many ways. Learning how to compromise, how to blend two worlds into one, how to build a life together was often a complicated blur of highs and lows. I knew I wanted our marriage to last, but I didn’t know how to be slow enough to be present. All my work came home every day. Even when I wasn’t working, I was talking about work. Not to mention I was an enabler to other negative behaviors to people outside our home. There were all these influences continuously pulling my attention away from just being present with my husband. I didn’t realize my distracted gaze was sabotaging me from laying the pillars of our marriage. The signs were there. I was looking on my phone, instead of laughing with my husband. I was working on my computer in the room instead of dancing in the living room. Everyone and everything else was becoming a priority to my marriage. Again, this was not the marriage I wanted and the change needed to happen in me. What do you do when you are too busy to be present in your marriage? When you are home, be home. Create time where you do not talk about home, bills, or children. Make prayer, talking, and laughter three regular parts of your day. Hug and kiss every day. Those beginning years of marriage taught me numerous lessons about me. Wanting a marriage to last a lifetime doesn’t just happen. Lasting marriage occurs when two people place God in the center while choosing to show up, do the work, and pick each other every day. Let your love be stronger than any fear, trauma, or pain. You can choose today to stop sabotaging your marriage and let God fill the gaps creating a union to last a lifetime. Want more help to continue building your marriage? This article really hit home, thank you for sharing. I’m so guilty of number 1 oh man. Dad raised me to not need a man. I had to work on being a compliment to my husband. Learning how to let our spouses help can be challenging, but it is freeing when we do. We are a team meant to help each other out not outdo each other. Thank you so much for sharing Flossie! All marriages take work, being willing to deal with the hard things and loving fiercely. Being with the right person makes all the difference. Thank you so much for sharing this. I love that you mentioned we have to accept God’s love to truly accept one another’s love. Thank you for being so transparent! Thanks Trish! When we have an intimate relationship with Christ, everything flows out of it. We love more, give more, serve more because we have so much more in Christ. Those were also my husband’s words a little while back. Life throws so much hurtles at you, it is so important to slow down and reflect to keep a healthy relationship. Unfortunately you don’t get married and be happily ever after without putting in some effort continuously. Anything worth having takes work and effort. I am so glad you were able to hear your hubby just as I was able to hear mine. That is a continual prayer for me, “Lord help me to hear him.” Sometimes that means being able to hear I am wrong. Everything you mentioned here is so true. With our baby, our careers, and my blog it can really be challenging to stay in the present. Thank you for sharing. Right Kyra! I don’t want to spend all this time building a career only to realize I lost the love of my life. This is such wonderful advice!!! This is such a great read and a perfect reminder to all married couples. I am so guilty about being busy and I guess I need to set my priorities straight. Will definitely work on it. Thank you for sharing this. Super appreciate it. You are not alone Clarice. Disciplining ourselves to shut down and be present is an ongoing choice. The first tip I really need to work on. I feel so OCD about everything so I don’t even want my hubby doing it sometimes, but then I get overwhelmed. Thanks for your ideas! Oh, I get it Lorena! Sometimes we have to count the cost and decide if it’s really worth trying to do it al. But I AM usually right! (hehe!) Yes, I think most people operate out of fear which catches up to you at some point. Oh, yes! That fear factor can definitely get in the way. I definitely agree with the third sign of marriage sabotage – I try to be present and to leave all distractions aside when it’s “our” time. I think often time we it too comfortable in our relationship with each other. This is a great reminder to move each other and stop and think about what we’re doing. Great article! Filled with lots of truth! “I didn’t act out of a great love. I operated out of a great fear.” – These words spoke volumes and hit a nerve. Thank you for sharing these actionable steps to take to shift our mindset and work together as a team. Wow, Number 1 spoke to me. That is exactly what I went through when I married my husband. It was a tough process but so grateful for the transformation. That reminded me how good God has been to us in our marriage. Thank God for the process. When we stop looking at the other person and allow God to transform us, so much changes. Working on a marriage isn’t easy and self-sabotage is so much more common than people think. Not to mention coping with societal pressures (sexism, racism, classism, etc.). It definitely takes the work of both parties to be successful. Oh those societal pressures on marriages are tough. It interrupts more in marriages that people realize. I’m so guilty of number 1!